If you are like my family you probably love spaghetti. We probably eat it about once a week, though I do mix it up a little. Sometimes with meatballs, sometimes with sausage, sometimes cooked inside garlic bread, or maybe even baked, but we eat it. A lot. Another thing that varies, is my spaghetti sauce. Now I find a lot of creative ways to get veggies into our meals. And even though the kids are actually all good veggie eaters, it never hurts to find other ways to get our servings in, because lets face it, we probably still don’t get enough. I brown the hamburger then add the seasonings. Next I add all my chopped ingredients and last the sauces. Last, I divide the sauce into two gallon size freezer bags. Lay flat to freeze. When it’s time to use your sauce put into crockpot on low for 3 hours to simmer. Serve over fresh pasta. 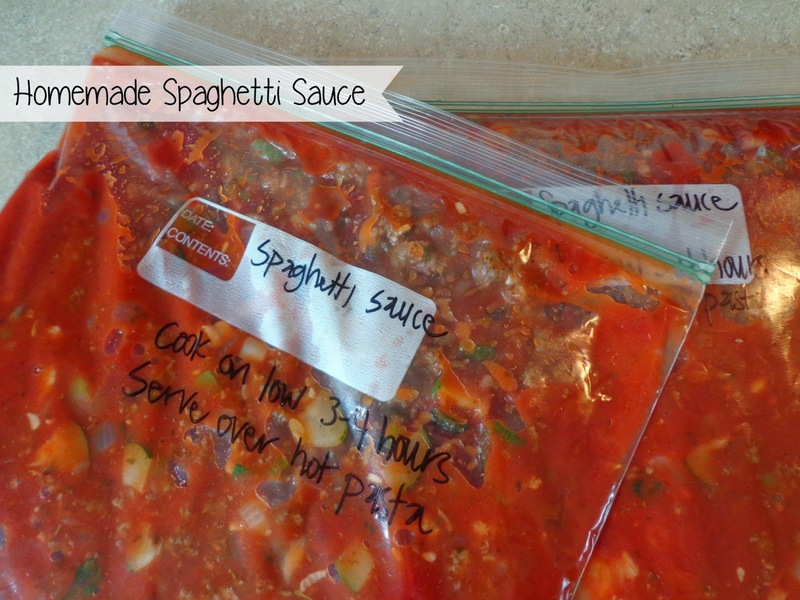 Spaghetti is one of my favorite foods, and yet somehow I have never had homemade sauce, I have GOT to give this a try!